To see an animated version of this procedure, click Procedure In Motion . Meniscus is cartilage in the knee joint. It helps to stabilize and cushion the knee. A meniscectomy is the removal of all or part of the meniscus. A meniscectomy is done when the cartilage is damaged. Damaged cartilage can cause pain or give you problems with knee motion. There are 2 methods for meniscectomy. 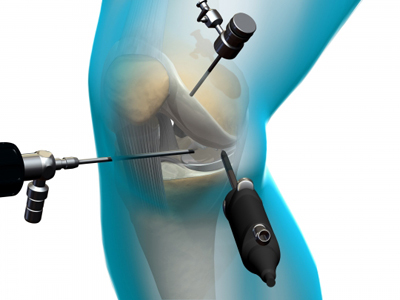 The more common procedure is called arthroscopy. Arthrotomy, an open technique, is rarely used. This may also be referred to as an open meniscectomy. Small incisions are made around the knee. Special tools are inserted into the knee joint. A tiny camera will provide a view of the inside of the knee. The damaged meniscus is either repaired or removed. The goal is to remove as little cartilage as possible. A drain may be inserted to drain away fluid. The incisions are closed with stitches. A larger incision is made over the knee joint. The meniscus is then either repaired or removed. The incision is closed with stitches. It usually results in a longer recovery period. This process is usually done when there are problems with the knee that make the arthroscopic procedure difficult. The procedure usually takes less than 1 hour. Use crutches or a knee splint as directed by your doctor. Do exercises as recommended. You may start with simple thigh muscle exercises the day after surgery. More strengthening exercises will be added later. If the meniscus was removed, it generally takes 3-6 weeks to return to full activities. If the cartilage was repaired, it can take up to 4 months for full recovery. The goal of the first week is to reduce pain and swelling. After this, the goals are to increase range of motion and weight-bearing. Physical therapy is often done several times a week for 4 weeks or more. At 6-8 weeks, low impact activities can often be added. This will help to prepare you to return to sports or activities. Running, cutting, and rotation are avoided for at least 16 weeks. Arthroscopy. Johns Hopkins Medicine website. Available at: http://www.hopkinsmedicine.org/healthlibrary/test%5Fprocedures/orthopaedic/arthroscopy%5Fprocedure%5F92,P07676/. Accessed March 27, 2018. Knee arthroscopy. Ortho Info—American Academy of Orthopaedic Surgeons website. Available at: http://orthoinfo.aaos.org/topic.cfm?topic=A00299. Updated September 2016. Accessed March 27, 2018.